The value of mulching is one of the most important things I’ve ever learned as a gardener. Simply adding organic matter to the soil surface can suppress weeds, help retain soil moisture, insulate roots from extremes of hot and cold, feed plants, and improve soil structure. Best of all, mulch can be made – for free! – in your own garden. Read on to find out what kinds of mulches you can make at home, how to get more when you run out, and how to use them for maximum benefit. Well-rotted homemade compost is wonderful stuff – sweet-smelling, crumbly and packed with nutrients. When laid on the soil surface 5-10cm (2-4in) thick it does a great job of suppressing annual weeds. Most plants will thrive with a mulch of compost. It’s precious stuff though, so it’s wise to reserve it for your hungriest or most treasured plants – there’s simply never enough! To make most effective use of your compost, use it for mulching in spring to prime to the soil ready for the year’s plants, around autumn-planted vegetables like garlic, or in potting mixes. For many gardeners, figuring out what to do with grass clippings can be a headache. But the answer is right there in your garden! Grass clippings make excellent mulch at a time when other mulching materials may be in short supply. Mulch thinly with grass clippings every week or two throughout the summer. Grass clippings are readily taken down into the soil by earthworms and other soil fauna, and also add a small supplement of nitrogen to the soil. It’s important to add grass clippings thinly – aim for no more than an inch (3cm) deep. Any thicker and it will quickly turn into a sour, vinegary smelling sludge. 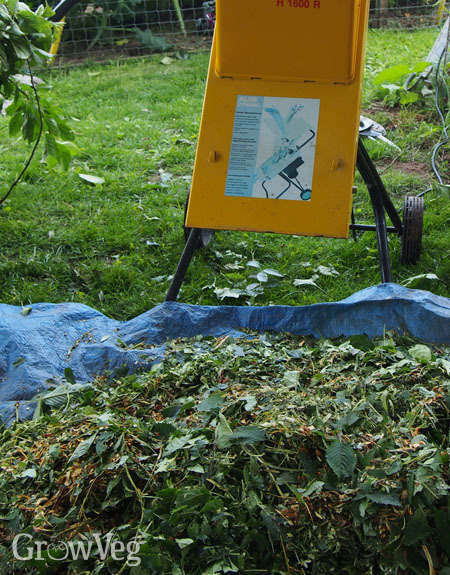 The best solution, if you have enough room in a sheltered spot, is to spread out the clippings on a hard surface and dry them out for a few days. They can then be added more thickly to the soil if you wish. If you’re unable to do this, do be aware that fresh grass clippings may root into the soil and contain grass seeds. I find the benefits outweigh the drawbacks however – a weekly hoeing before adding more mulch helps keep it under control. It’s essential to make sure that no weedkiller has been used on the grass, as any residues may harm your crops. About once a month, take off your mower’s grass bag or insert your mulching attachment and leave the clippings on the grass. They’ll feed the lawn, ensuring it keeps producing more healthy growth for you to cut and use. Wood products such as sawdust, wood chips, bark chips and pine needles (pine straw) have a bad reputation. When dug in, they are said to ‘rob’ nitrogen from the soil as they rot down. Using them to mulch around established fruit trees and bushes or perennial vegetables is usually fine however. They will help suppress weeds and contribute to a well-structured soil once they’ve rotted down. Most gardens containing shrubs or trees produce lots of small prunings every year. It could be worth investing in a small shredder. Spread over many seasons, the initial purchase becomes very low indeed. I was lucky enough to nab one second-hand a few years ago, and it reduces mountains of branches and twigs to useful mulch every spring and autumn. Branches that are too thick for the machine can go on your fire if you have one, or be used to make bug habitats. To source more, it could be worth making friends with local tree surgeons, sawmill operators, landscapers or professional gardeners. They're often happy to let you have waste products such as sawdust for free to avoid having to pay to dispose of them. Sawdust should be used with care, as if used fresh it can mat together and make it hard for water to permeate. It makes a great path surface if replenished annually, but if using it on beds let it rot down first. The aforementioned tree surgeons, landscapers and gardeners may also be willing to drop you off a few loads of leaves in the autumn. If leaves have been gathered from roadsides or anywhere else where they're likely to be affected by pollutants, store them until they’ve rotted down into leafmould before using. Of course, if you have any trees in or near your garden you may find that you have a ready supply. Raking leaves can be welcome warm work on a chilly autumn day. Neighbours might also let you rake up their leaves, or may even be glad to deliver them to your garden just to be rid of them! 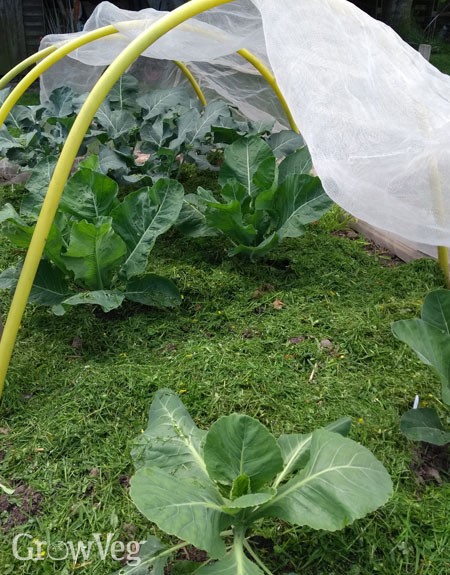 Leaves can be used as a thick, insulating blanket over empty beds or around overwintering plants, but as they’re loose and light they usually need to be weighed down with netting or lengths of wood laid across the bed at intervals. Chopping the leaves up with a few passes of the lawn mower makes them less likely to blow around and lets rain pass through more easily. Leafmould (rotted leaves from deciduous trees) is similar to compost, but is less rich in nutrients. It can take two years or even longer for leaves to rot down enough to be considered leafmould. Once added to the soil, leafmould becomes incorporated relatively quickly and needs topped up regularly. It has a beneficial effect on soil life, which results in better plants, so is a very desirable addition to the vegetable garden and to potting mixes. These mulches may be free but their value to gardeners is inestimable! They help reduce the arduous tasks of weeding and watering in summer, protect your beds over winter, and improve the soil all year round. Consider them an additional ‘harvest’ that will contribute to your garden’s overall productivity. Your plants will thank you!